FEATURE PHOTOS CAPTION: Adlai and Jen Mendoza moved from Chicago to Aurora’s Ward 9 and have found it to be an ideal place to raise their family. Back in the day, Beverly Hills 90210 was a trend-setting TV show about the experiences of a group of young people in Beverly Hills, CA, navigating the trials of school, college and ultimately the real world. Today’s equivalent just might be Aurora 60503. Aurora’s Ward 9 has been named the top suburban millennial hot-spot in Illinois by a nationwide housing search website. 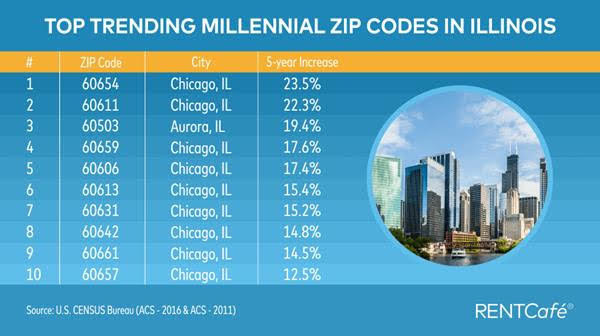 In a study released last week, RENTCafe listed Aurora’s 60503 ZIP Code as a top area in Illinois that has seen a recent spike in millennials, only being outranked by Chicago’s 60654 and 60611 zip codes. With the exception of Aurora’s No. 3 ranking, all other areas in the top 10 are in Chicago. To identify where millennials live and what are the next millennial hot-spots, RENTCafe ranked ZIP Codes in the 30 biggest U.S. cities and surrounding suburbs by the highest increases in millennial population over a five-year period, by the largest share of millennials, and by the highest number of total millennials, using the most current U.S. Census population estimates. “We are thrilled to learn of this new distinction regarding millennials moving to the Ward 9 community,” said Ward 9 Alderman Edward J. Bugg, who noted his ward was ranked in 2017 as the No. 1 community in the country for affordable housing with top rated schools. Millennial residents in 60503 agree with Bugg’s assessment. In its study, RENTCafe shows when choosing where to live, millennials value experiences more than material possessions and prefer vibrant, walkable city neighborhoods where things are happening. Ben and Ashley Stromberg moved to Aurora six years ago and have found it to be a great place to raise their four children and to build family memories. The study also reports millennials are moving to areas with a variety of close-by amenities in the neighborhood and nearby towns, and to areas with quick access to large urban cores, like downtown Chicago, but without the hustle of large crowds and congested traffic. “We absolutely love the geographic location with easy access to shopping and events in the region,” said Alissa Kloster who moved to Aurora from Naperville. Mayor Richard C. Irvin believes the trend of millennials remaining in or moving to Aurora will continue to grow. The full RENTCafe study can be viewed at: https://www.rentcafe.com/blog/apartmentliving/lifestyle-apartmentliving/u-s-zip-codes-that-are-millennial-strongholds/.